The recent partnership of Myles Hartley and Bill Stoneham is now to be short lived with Myles Hartley taking up a position in the UK in September, so this is your only chance to hear two superbly matched musicians performing some simply breathtaking music. 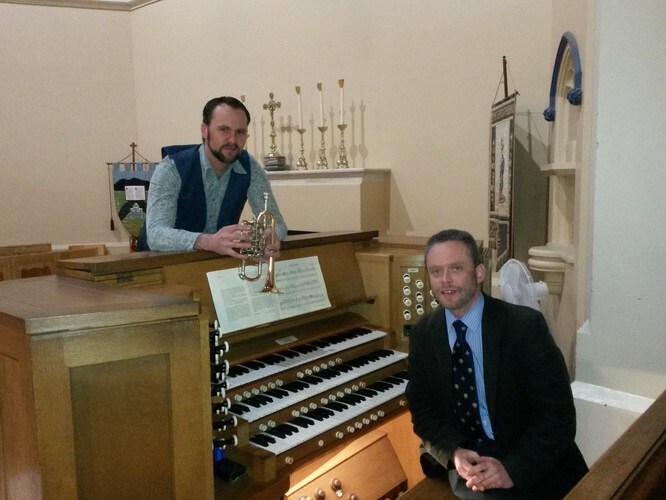 Following on from their highly successful concert in May at the University of Waikato's Wednesday Lunchtime Series, the duo move to the superb acoustics of St. Peter's Cathedral and to the pairing of organ and trumpet. The works you will hear are both breathtaking and angelic, a superb fit for the venue and the aptly titled 'Gabriel's Gift'. Myles Hartley is a freelance organist and pianist based in Hamilton, who moved from the UK in 2012. Before moving to New Zealand, Myles spent seven years Director of Music and Supernumerary Fellow at Oxford University's Harris Manchester College. September sees Myles returning to Oxford and Harris Manchester College as Director of Music and Lay Chaplin. One of the highlights of his performances in New Zealand was the opportunity to give a recital in the Auckland Town Hall as part of the Great Organ Classics Series in 2014. Myles is a Fellow of the Royal College of Organist and has recorded two solo CDs at Harris Manchester, including the organ works of John Ireland and Grayston Ives for Priory Records. Bill has been invited to perform with all New Zealand's major orchestras on many occasions, in particular the Auckland Philharmonia and Hamilton's Opus Orchestra. He has also performed with many orchestras in Australia, including the Queensland Symphony Orchestra at the 2012 Brisbane Festival. His solo career has seen him touring the length and breadth of New Zealand, performing with singers, organists, pianists and orchestras. He has been broadcast on live television and radio numerous times, and at the 2013 Nelson Winter Festival he was described by the Nelson Mail as, “trumpet player extraordinaire”. Bill has the generous support of Auckland Band Instruments and 2016 sees him undertake an invitation tour of the UK. The concert has an aptly angelic theme and will feature Telemann's popular Trumpet Concerto in D major with it celestial opening first movement. Myles Hartley will shine out through Charles Avison's Concerto in G major and also a splendidly rousing selection of Handel's Music for the Royal Fireworks. Other composers featured are Corelli, Viviani, Gluck and Purcell.